We offering Profile bending machine for different type and size of pipes, like round, square, triangle and rectangle in angle to round shape. 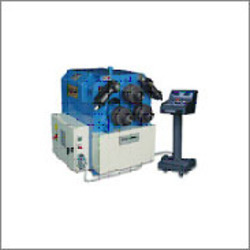 Profile Bending machine also can be made for plats, angles, bars and channels. There is also availability to bend profiles with our Profile bending machine. Bending machine can bend any metal profile of any shape . . .
Roller Hardness: 45 - 62 HRC. Ring Type Profile Bending Manufacture. Our profile bending machines revolutionized the section and profile bending market by using the same technology we currently use for our three and four roll plate rolls. We offer stronger, higher quality machines with better performances than other manufacturers at very competitive prices.